hire4event.com having wide range of led screen for all your event display need for exhibition concerts weddings and corporate event and conferences. 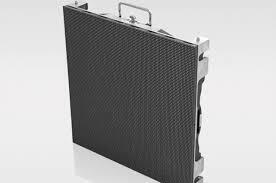 led display with Aluminum profile cabinet has the resolution of 160000 pixels each square meter. It means that you get a TRUE HD of 1080P, with a 4.8m x 2.7m led display. The rental LED display market developed very fast in the past years. The demand for HD rental led display has emerged from the market. We would like to recommend our P2.5mm Indoor rental LED screen with aluminum profile cabinet to the customers that request ultra high definition products. It has the resolution of 160000 pixels per square meter. The visual effect is very clear and sharp. If you want to play a 1080P HD video, a 4.8mx2.7m P2.5mm indoor LED screen will be qualified. Moreover, we use ultra thin, ultra light weight aluminum profile cabinets to match the ultra HD P2.5mm LED module. The integrated solution is absolutely perfect. Ultra High Definition - 160000 pixels/㎡. Ultra Slim - The thickness is only 82mm. Ultra light - The weight is only 29kg per square meter. Ultra convenient - The assemble and disassemble can be done without tool. The whole design is completely” plug-play”. Ultra quiet - Fanless system but good heat dissipation design. Ultra intelligence - LCD monitor equipped rear side, indicating working status. Ultra humanized - The cabinet size can be customized and the magnet front service is available.